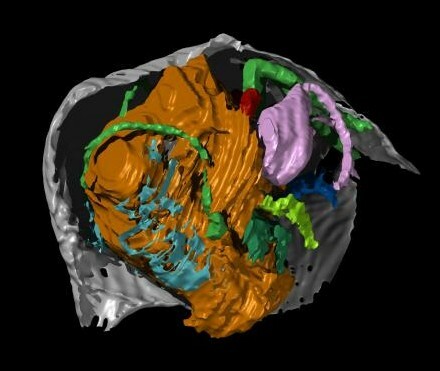 Researchers have unearthed a 425 million year old ostracod – with the soft body preserved within its outer shell. The study of the water flea like creature, which belongs to the animal group Crustacea, is published in the latest issue of Proceedings of the Royal Society B1, as well as in the online journal of the Natural Environment Research Council, Planet Earth. The unusually well preserved specimen, which has been called Nasunaris flata, is a member of a previously undiscovered species. This fossil, which is about 5 millimetres long, was found in Hertfordshire. “Most fossil ostracod species are known only from their shells. You need exceptional conditions to preserve the soft body- there are only two other known examples of ancient fossil ostracods where the complete soft parts of the animal are preserved along with the shell,” said the University of Leicester’s Professor David Siveter, lead author of the paper. The soft parts played a vital role in the correct identification of the specimen. In fact, the team was able to locate Nasunaris’ antennae, a pair of eyes an even the Bellonci organ – this is a sensory device which sticks out of the creatures middle eye, and is often seen in modern species. Ostracods are known as the most prevalent arthropods in the fossil record – having first emerged over 500 million years ago. Today they are also common, populating lakes, oceans and rivers worldwide. Palaeontologists can often use them to interpret past environments – the specific species of ostracod giving clues to such factors as water depth, and salinity.